The key here is the interior- round and smooth, with a little exotic pepper residue from the last time I used it- gross. Back to mortars. That’s a bedrock mortar. The interior kinda looks the same doesn’t it? Do you see how it’s got horizontal rings in it? That’s one of the tells. These were on the bank of a small stream. That’s another tell! That they’re near water. Most prehistoric sites are near water, but you knew that. The above is NOT a bedrock mortar. It is also NOT a great photo. My apologies, I was hacking through low-bush-like oak trees at the time. And also, it was very hot. 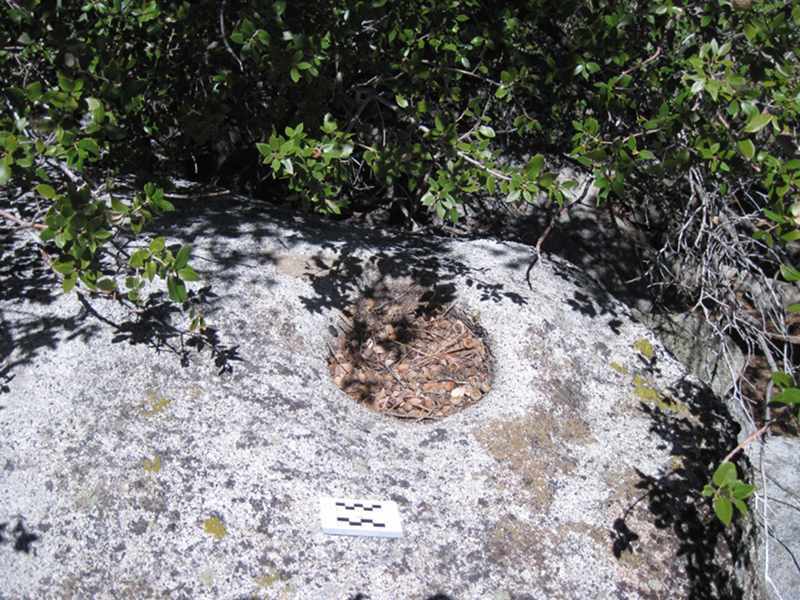 This non-mortar is located in the Sierra Nevada Mountains, just outside Sequoia National Forest. 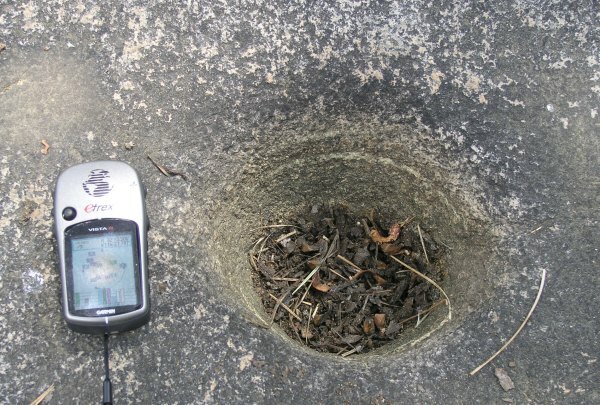 These non-mortars are formed by erosion. Water pools in the lowest area on a granite boulder. This water then seeps down into the rock, freezes and causes the rock to break apart. Also- these can be formed by aeolian (vocab word of the day) erosion- meaning WIND. For some reason, these non-mortars are called “solution cups” – that’s just for all you terminology geeks. I don’t know why they’re called that. I even asked around. No one knows. If you know, please tell me! 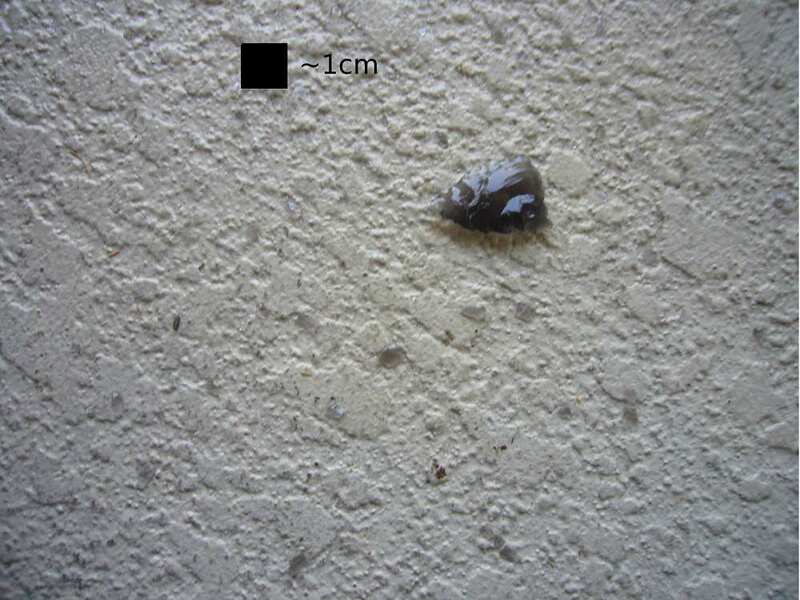 How do you tell a solution cup/non-mortar from a bedrock mortar? EASY. 1: Is it smooth anywhere? If your answer is YES, then it’s a bedrock mortar (in the cultural sense). 2: Does it have weird cracks? If your answer is YES, then it’s NOT a bedrock mortar (sorry!). 3: Is it perfectly round? If your answer is YES, then it could be EITHER (I tricked you. HAHA). 4: Is there other CULTURAL material nearby? If your answer is NO, then it could be EITHER (tricked you again). a) Feel. If it’s super smooth, it is probably cultural. This is the easiest way to tell. However, even if it’s not super smooth, it could still be cultural. Erosion could have acted on an already present mortar to make it less smooth. b) Surroundings. If there’s cultural material on the ground or nearby, it’s more likely that you have a cultural feature. c) Appearance. This is the least useful determinant. Generally I use this to tell from a distance (within my 10m transect) whether or not a hole in a chunk of bedrock is cultural. If it’s not super round, or if it is sitting on top of a huge crack, it’s probably not cultural. Still worth checking out though, because you NEVER KNOW! Do you have any other ways of telling whether or not a nice looking cup in a slab of bedrock is cultural? Comment or Email me! Rock art is going to have to wait. This post is long enough! If you made it this far- gold star for you! No seriously- email me. I’ll email you a gold star. So, I went to that flintknapping course I told you about this past Sunday- more about that soon. But, I thought I would share with you a revelation I had today while practicing flintknapping. My Revelation: Most of those flakes would fall right through my 1/8th inch screen. This is IMPORTANT because today I was screening what I knew MUST be a lithic reduction site, and I wasn’t getting that much stuff. Just some bland looking rhyolite pressure flakes. Back to the point of this bonus material, the Revelation. There are probably more flakes in the unit than I will ever see, no matter how good my eyes are, because they are FALLING THROUGH THE SCREEN! Now, those of you who are not archaeologists might just be like, “Well why don’t you get screens with smaller holes?” That would be impractical due to the amount of dirt we have to go through in one day. If the screen was smaller, say 1/16th inch, it would take a lot longer for all that dirt to go through the screen. For those of you who are archaeologists, and also flintknappers, or maybe had a lithics class at some point, you probably already knew this. WHY DIDN’T YOU TELL ME? Finally: I recommend that you all learn to flintknap, or at least try it, sometime soon. It’s fun! It’s painful. It’s amazing what you can create! Look forward to the post about the flintknapping course I took.